Dreaming in a new language and dating a transcendent entity: A couple of memoirs for the non-fiction fans on your gift list. The general consensus on this year’s best books lists suggests that Lit by Mary Karr is a stand-out memoir, so that one’s going on my personal wish list for the holidays. Two other memoirs of note this year, Dreaming in Hindi and Dating Jesus are also worthy gifts to give. In Dreaming in Hindi: Coming Awake in Another Language, former magazine editor Katherine Russell Rich travels to India after overcoming cancer and then settles into the northwestern part of the country for a year to learn Hindi. She chronicles her experiences – first verbally stumbling at every turn and eventually making jokes and even dreaming in her new language – with a subtle humor and a poetic spirit. Rich also became an expert along the way in linguistics and neuroscience, and she skillfully weaves the latest research about how adults learn second languages into the narrative. That book won't carry itself. Later, she mentions to a linguist, “It was as if in Hindi, I became a different person.” Rich analyzes the research about how language affects thought, but in the end, she’s all about the poetry. For an extra flourish, pair the book with an exotic-looking fair-trade bag from Ten Thousand Villages. Another memoir that combines endearing humor and impressive scholarship, Dating Jesus: A Story of Fundamentalism, Feminism and the American Girl preaches the gospel of independence. Journalist Susan Campbell writes thoughtfully about her church-heavy girlhood in Missouri. An irrepressible tomboy, Campbell asked questions sitting in her pew from the start and seemed to always know something wasn’t quite right when she was told that women were expected to remain silent in church. Although she didn’t stick with church, her questions eventually led her to seminary, and she merges her story with the work of philosophers, historians and feminist theologians. “Fundamentalism broke off in us, didn’t it?” Campbell’s brother once asks her as they attend a church service together as adults. She agrees – it broke off in her like a sword, she muses, and much of Dating Jesus is about Campbell healing that wound. Recalling her early years, Campbell writes about witnessing door-to-door, playing baseball, taking her fashion cues from The Brady Bunch and singing hymns in four-part harmony. She writes about loving seminary classes many years later, especially when one of her professors says that many of the early Biblical texts subvert the hierarchy. And yes, she writes about dating (and not dating) and dancing (and not dancing) and loving the real Jesus – the egalitarian one – despite what religion has to say about him. For a little extra flourish, pair the book with a tube of Looking Good for Jesus lip balm and get more “subvert the hierarchy” bang for your buck. Two memoirs for the non-fiction fans on your holiday gift list. 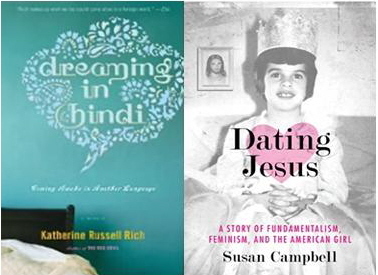 Dreaming in Hindi: Coming Awake in Another Language and Dating Jesus: A Story of Fundamentalism, Feminism and the American Girl. Another memoir that combines endearing humor and impressive scholarship, Dating Jesus: A Story of Fundamentalism, Feminism and the American Girl preaches the gospel of independence. Journalist Susan Campbell writes thoughtfully about her church-heavy girlhood in Missouri. An irrepressible tomboy, Campbell asked questions sitting in her pew from the start and seemed to always know something wasn’t quite right when she was told that women were expected to remain silent in church. Those questions eventually led her to seminary, and she merges her story with the work of philosophers, historians and feminist theologians. Pretty, cloth-covered books to gaze at, give away and even read. As one of my most discriminating and zeitgeist-attuned readers, you’ve probably seen or read about these new Penguin editions of several classics somewhere by now. Nonetheless, I put them before you here and suggest that they’re a most suitable answer to many a gift-giving situation. Why the commotion? Sure, they’re beautiful. And sure, they’re classics: Mr. Willoughby and Miss Havisham and social conventions and moral dilemmas and all that. But I admire the books for a couple of other reasons as well. 1. The designer, Coralie Bickford-Smith, took the book’s themes into account when she created the covers. As she explained on Design*Sponge, “The peacock feather on Dorian Grey, for example, plays on the book’s themes of vanity and the superficial, whereas the leaf motif on Jane Eyre refers directly to the lightning-blasted chestnut tree, a concrete element in the text that serves as a potent symbol of the book’s central relationship.” Smart and pretty – we like that. 2. The pages feel as sumptuous as the covers look. You know how the pages on some classics feel cheap or sometimes a little gritty? Not so here. The pages are smooth and heavy and thick with importance. So in this case, judge the book and the cover and the personality of those on your gift list all at once. Illuminate someone on your holiday gift list by pairing a righteous book or two with just the right accessory. Saintliness, now found in pockets and boxes. 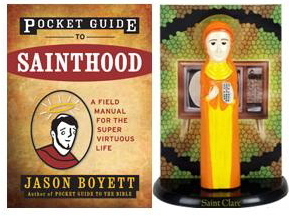 Jason Boyett’s Pocket Guide to Sainthood: A Field Manual for the Super-Virtuous Life captures the glory, the shame and the silliness of saints throughout history. Starting with St. Ambrose and ending with St. Vincent de Paul (surprisingly, not the only saint who was captured by pirates), Boyett irreverently chronicles the miracles and trivia surrounding everyone’s favorite saints – and also the ugliest one. Boyett includes the saints’ miracles but also tidbits he generously labels “what not to venerate,” such as, you know, mass slaughters and the like. Boyett’s consistently entertaining tone and unexpected asides create an amusing backdrop for what’s actually a highly informative book. The section about Mother Mary, for example, will clear up her status once and for all for any confused non-Catholic. The book lists a glossary of saintly terms as well which saints to call upon for any occasion from watching television to paratrooping. So what to pair with this “witty, weird and sometimes even wise” – as reviewer Daniel Radosh declared – book? A plastic tribute to St. Clare, patron saint of television, of course. I personally have had this beatific statue from Archie McPhee unobtrusively positioned near my television for several months, and I’ve never felt more enriched by my small-screen viewing. 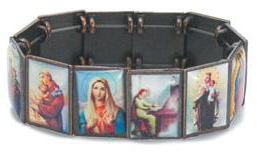 Alternately, pair the book with a saints bracelet from Signals. For a book with fewer religious trappings but more spirituality than you can shake an incense stick at, give someone on your list Get High Now (Without Drugs) by James Nestor. I mentioned the Get High Now website earlier this year, but you can’t very well wrap up a website and put it under the tree. (Not that I’m saying you aren’t clever. You are – I know you are. I’m just saying it’s easier to wrap a book.) Actually, the book isn’t about spirituality per se or New Age-style meditation: It details the science behind drug-free highs and which techniques – meditative and otherwise – are proven to work. Nestor advocates against trying every technique he mentions (avoid the bee sting approach, he stubbornly insists) and includes surprising hallucinogens such as giraffe liver. Some of the techniques, though, are as simple as breathing, which is the first of the suggestions that Nestor himself tried years ago as he uncovered research that an eccentric uncle left behind when he died. His uncle’s notes eventually became this book, which is fascinating and funny and gives you more than 175 ways to alter your consciousness. 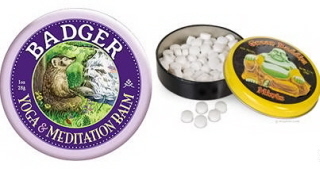 You’d think giving a person 175 ways to change his or her life would provide enough holiday cheer, but go one more step and throw in some Buddha mints, a tin of Badger meditation balm that smells like sandalwood or my favorite incense – the desert pinion sticks really do smell like you’re having a mountaintop experience with a fire crackling nearby (no cloying aroma, I promise). So many convenient ways to reach enlightenment these days. In honor of Halloween and the zombies and vampires dotting our pop-culture landscape nowadays, I’m kicking off an occasional Quote-o-Matic series. It’s probably a similar yearning for supernatural mystery that draws so many of us to zombie and vampire lore. But instead of presenting an insightful analysis of this phenomenon, I’m busy thinking about a vintage hamburger commercial. Remember that old McDLT commercial from the ’80s with Jason Alexander? “Keep the hot, hot – keep the cool, cool!” sang the eager carnivores as they danced down the street. Right, so let’s “Keep the evil, imaginary – keep the good, real!” You may need watch the commercial again and then sing it aloud with the new words to feel where I’m going here. Imagine if I had staged a musical number with subtle allusions to “Thriller” and the McDLT and French philosophy as a commentary about the illusory, tempting nature of fictional evil. Noone would have seen that coming. Not even the most charming of savvy, Louisiana-based vampires. Books that set the world on fire should not be set on fire by the world. There’s no time like Banned Books Week for picking up some incendiary reading. We don’t really need an excuse to revisit a classic or two, but librarians like to remind us at this time of year that some books are still endangered. When the act of reading a book is subversive and charming in one fell swoop, we like that. Practicing the maintenance of extreme delight. Anyway, she told the interviewer the most delightful thing. She was talking about how much she loves drinking coffee. I’m paraphrasing here, but she said that sometimes she’s so excited at night, knowing that she gets to have a cup of coffee when she wakes up the next morning, that she can’t get to sleep. I just love that. I mean, I really love that. I love that she reminded me to be intensely happy whenever I’m so inclined. The Charm-o-Matic revels in those moments. That’s tapping into the charm happening all around you. Either that, or it’s just a really, really, really good cup of coffee. Deciding whether to fend off or embrace Facebook and zombies, Jane Austen shows once again that she really is just like us. Once the topic of Jane Austen comes up, I find I rarely can contain myself. Did you know, for example, about the upcoming Jane Austen zombie book? As the Quirk Books site explains, “Pride and Prejudice and Zombies features the original text of Jane Austen’s beloved novel with all-new scenes of bone-crunching zombie action.” Please understand that the Charm-o-Matic rarely condones of any kind of brain eating or other crimes perpetrated by the undead, but every person of discretion knows to make occasional allowances. Also by the same publisher is the delightful Jane Austen Handbook, a guide for those who long for a little Regency-era England in their everyday lives. And they’re not new, but I certainly hope you’ve been made aware by now of the Jane Austen puppet and action figure. A sci-fi Austen-themed miniseries (Lost in Austen) debuted a few weeks ago on the Ovation network, but alas, my cable provider does not offer such gentle pursuits. Oh, and Jane is podcasting, too. Actually Masterpiece asked life coach Cheryl Richardson to offer her take on what we can learn from Sense and Sensibility through a free, two-part podcast that you find by typing in Cheryl Richardson or Masterpiece on iTunes. Now then, after this necessary discourse and before presenting you with more succinct linkage to the worthy endeavors I have put before you, I shall proceed to inform you that I look forward to attending an exceedingly good ball within a fortnight. Actually, my only certain plans within a fortnight include attending a hockey game. I dare say it will make a very pleasant evening, nonetheless (and ties in with the aforementioned bone-crushing in a most unexpected way). In the meantime, I trust you have found these niceties agreeable. I have every disposition in the world to join you again soon. A new illustrated collection of Emily Dickinson’s poetry is presumably for kids but would feather anyone’s bookshelf. Hope’s all the rage these days after our recent election, but Emily Dickinson got there first. One of our greatest poets, Dickinson’s reputation as America’s favorite quirky hermit sometimes overshadows her genius. This new collection, My Letter to the World and Other Poems, presents a few of her rightfully well-known poems with drop-dead gorgeous illustrations by Isabelle Arsenault. 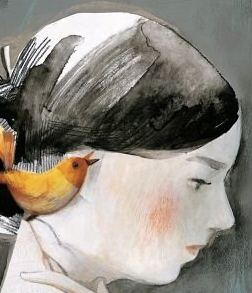 While hope (that “thing with feathers”) is perched on Dickinson’s shoulder in the cover illustration, many of the poems she wrote describing her feelings toward death and isolation are featured in this collection as well, which is part of a series that pairs classic poems with contemporary illustrations. Arsenault’s paintings complement the poetry beautifully, and it’s hard to avoid words like “haunting” and “dreamy” when describing them. So yes, the illustrations are haunting and dreamy, but they also contain a good bit of whimsy (you have to peer through the death imagery to get it, which is just as Dickinson would have liked it). Taking a Dickinson seminar in grad school, I discovered that her initial poems were prettied up a bit by her first editor. It was nice of him to publish her and all (which isn’t quite how they say things in grad school), but by trying to make her what he deemed presentable, he put her work in packages that she didn’t really intend. Paired with these illustrations, the poems have another context entirely. One of my favorites opens the book: “There’s a certain slant of light, / On winter afternoons – / That oppresses, like the heft / Of cathedral tunes.” The first time I read that poem as a child, I was astounded that someone understood my hidden melancholy. So even though the aforementioned “haunting”-ness may not make this book the very merriest of holiday gifts, the hope is there, too – and the smart kid on your list will appreciate the nuance.